Back in September Hubby and I celebrated our birthdays, Dr Seuss style with our friends! We decided to have an afternoon tea for our family to celebrate with us too. Yay, twice the celebrations! I made our cake (of course) but I wanted to try something a little different for me. I wanted to make a dessert-y type cake. So often people like the designs on cakes they see and will ask me to make a fondant covered cake, in fact, no one has asked me for a dessert-y cake! 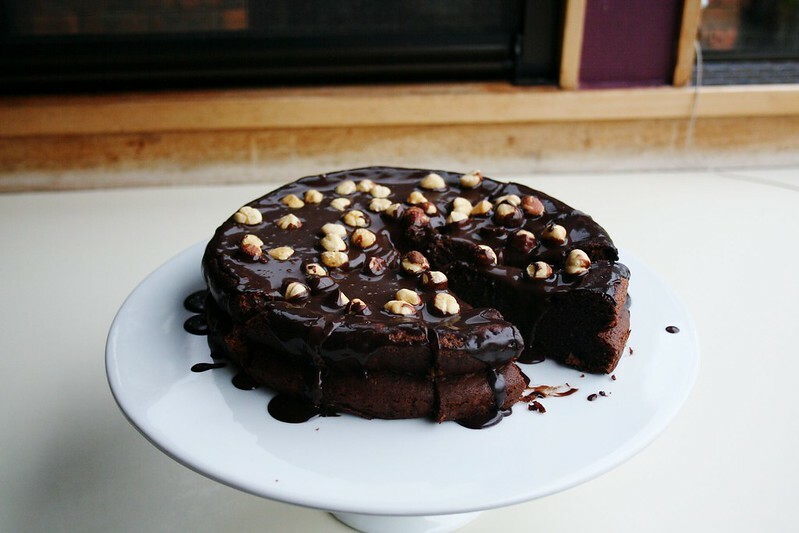 That might change after they see/taste this Nutella cake! My only problem was the ganache. Sometimes me and chocolate ganache do not see eye to eye and this was one of those times! It just DIDN'T set, it didn't even get to a piping consistency, it was just RUNNY! I was cursing at Nigella until I had my first bite...then I forgave her! It was gooey and delicious and went wonderfully with the dense cake. Preheat the oven to 180 degrees C and line a 9" cake tin. In a separate bowl, beat the butter and Nutella together. Add water, egg yolks and ground hazelnuts and mix until combined. Toast the hazelnuts by spreading them out on a baking tray and put in the oven set to 180 degrees C, fan bake for about 5 - 10 minutes, they will start to smell good and the skins will start to separate. Remove from oven and place the hazelnuts in a tea towel then roll them around to get rid of the skins. Make sure these are completely cooled down by the time you put them on the cake! Heat the cream, water and chocolate in a small pot over a medium heat. When chocolate is completely melted remove from heat and whisk for a couple of minutes then leave to cool until it reaches the right consistency to ice the cake with (mine turned out quite runny). Remove the sides of the tin (if using a spring form tin) and spread chocolate ganache over the top of the cake. 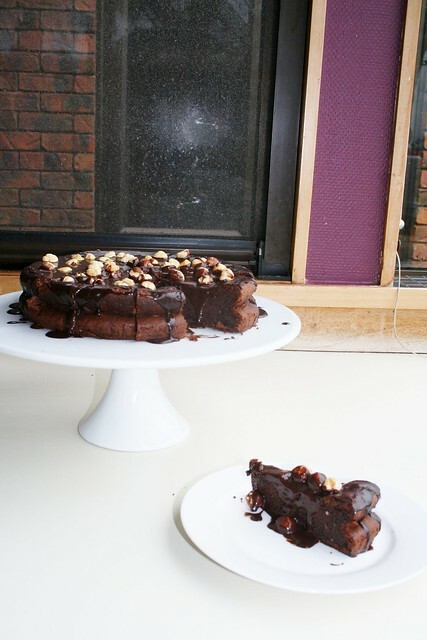 Place the toasted hazelnuts on top of the cake and enjoy! Thanks to my AWESOME niece, Georga, who lent me her camera on the day to take some snaps before it got all eaten up! I'm submitting this post in Sweet New Zealand, which is a great way for Kiwi Food Bloggers to get to know each other. If you're a keen food blogger why not join? This month is hosted by the lovely Shirleen from Sugar and Spice. Dude. This looks freaking delicious! When I'm allowed to eat everything again I'm totally making this! This cake looks like heaven! Heavenly looking cake, and I definitely wouldn't be worried about non-setting ganache on that cake. What a beauty! 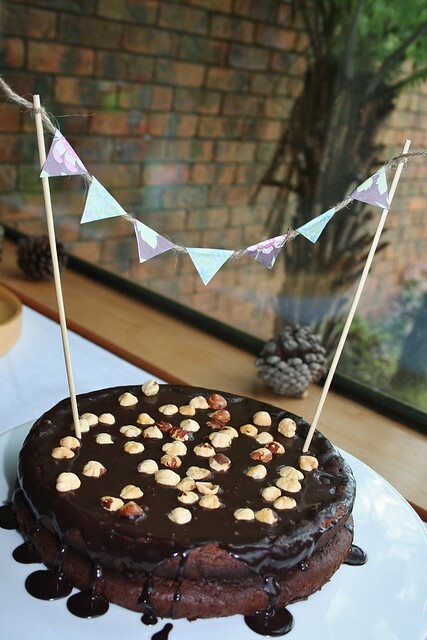 I actually made this cake for my husband's birthday and wow, was I popular - hazlenuts & chocolate are one of his all-time favourite combinations. I found that, on the crazy chance you have any left over, it freezes really well, then, if you have a microwave, you can warm it up from frozen and it goes all gooey and fudgey. What is 1 T water?